Because the agricultural potential of the lands where this species is from is poor the possibility of large-scale habitat loss due to cultivation and expansion is not impending. 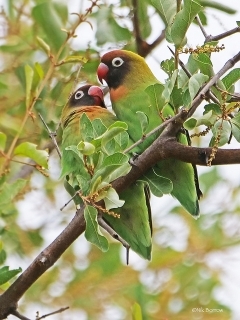 Both adults dark face with olive coloured nape; green body and rump; pinkish/rust patch on chest; tail green. Bold white eye-ring, dark eye. Red bill. As in adult but with dark green underparts; black at base of bill. Cage or aviary, indoors or outdoors, minimum length 1.2 m (4 ft). Mixture of small seeds (canary, millet and oats); fruits such as apple, orange, banana; vegetables such as green leaves, carrot, celery, green beans and peas in the pod; spray millet; complete kibble. Loves baths, fir tree and other branches, wood toys, swings, ladders, mirrors, vegetable tanned leather chewable toys. Very adventurous when let out so make sure it is safe (no open water, hot stove, toxic plants). Trapping for wild bird trade; habitat loss, drought conditions, changing agricultural practices (from sorghum to maize). Highly restricted range, from southern Kafue National Park, southwestern Zambia along Zambesi valley to Victoria Falls, Zimbabwe. Found in mopane and Acacia woodland; also occurs in riparian forests and areas with fig trees. Found at 600-1000m (1968-3280 ft). Forages for seeds (annual herbs), grain, flowers, buds, young leaves and berries. Generally stays near water source, found in flocks of up to a few dozen birds. May roost communally. 4 to 6, slightly elliptical, 21.5 x 16 mm (0.8 x 0.6 in). Breeding only known from captivity but thought to resemble Nyasa Lovebird, November-December.